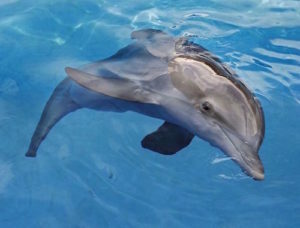 Only two months old, Winter the dolphin was dying after getting tangled in crab trap line near Cape Canaveral in December 2005. A fisherman found her, cut the line and called a rescue team. 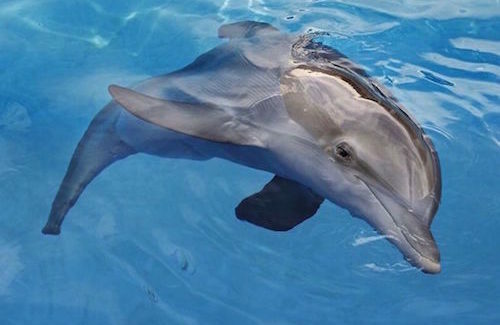 Transported to Clearwater Marine Aquarium, Winter overcame overwhelming odds and lived. But she lost her tail. Doctors created a prosthetic tail for Winter which she wears about an hour a day for exercise to strengthen her spine. Her tale was spotlighted in the popular 2011 film “Dolphin Tale,” filmed at the aquarium. Quadruple amputee Ellie Challis was inspired to learn to swim by Winter, Potts said. Now Ellie plans to complete in the 2020 Paralympics for swimming. When Ellie was just 16 months old, she caught a deadly strain of meningitis that caused her heart to stop beating for two minutes. Given a 5 percent chance of survival, Ellie lived but her arms and legs had to be amputated. Now 13 years old, Ellie has traveled from her home in England to visit Winter three times since 2013, the most recent on May 31. “Ellie says that if Winter can swim without her tail, then she can swim without her arms and legs,” Potts said. Opened in 1972 on Clearwater Beach in Florida, Clearwater Marine Aquarium works to “research, rescue, rehab and release” marine life. The aquarium is home to rescued dolphins, sea turtles, river otters, stingrays, nurse sharks and more. Sometimes, however, rescued animals have injuries so severe or have survival skills so damaged that the rehabilitated animal can’t be returned to the wild. Instead, they become permanent residents at the aquarium. That is what happened to Winter. And, unbelievably, it also happened to another dolphin. “Hope was orphaned so young that she doesn’t have the survival skills necessary to survive in the wild. Her home is here,” Potts said. As part of its educational mission, the aquarium offers 90-minute boat tours where visitors can watch for dolphins, sea birds and other marine life as a guide narrates the scenic ride. The boat stops on a small island where visitors can stretch their legs and search for seashells. During a net pull on the boat, visitors can get up close with sea creatures before the critters are released back into the bay. For a look behind the scenes at the aquarium’s lifesaving work, visitors are invited to see the Surgical Suite and hear some of the many success stories. “Although ‘aquarium’ is in our name, we are really a working marine hospital,” Potts said.